This past week, we read an excerpt from "Home of the Brave" by Katherine Applegate in our literature anthology. It's a compelling read, even though the excerpt doesn't come close to matching the power of the rest of the book, and kids were enthralled. As we talked about it in a small group session, one student said, "Can we write an essay about this?" Wow. A student actually requesting to write an essay! The next natural question was, "What would we write an essay about?" 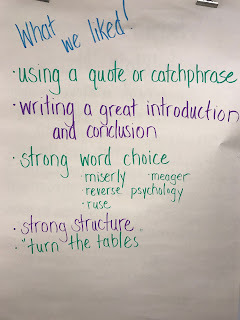 and the small group came to life with a discussion about what kinds of essay prompts would work for this text and why. There were no formulas, no acronyms--just a meaningful conversation of how we could write about this text. This was a hard-fought victory. For the first time, I feel that my sixth graders are really moving forward with being able to frame strongly written essays to analyze text. I have mixed feelings about this--on the one hand, I'm pleased with the progress that they're making; on the other hand, I recognize that every new curricular topic replaces something else, and I wonder what my students are missing now that we focus so heavily on the text-dependent analysis essay. 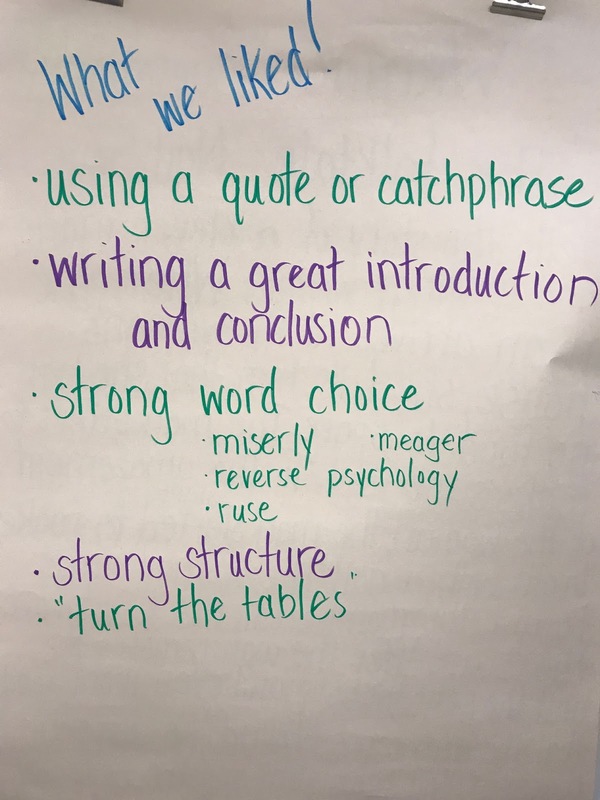 Ah well, those musings aside, here are some techniques that I've used this year to help us to get to a point where text-dependent analysis essays are meaningful. I will say that these techniques are not for the faint of heart or those looking for a quick and easy answer. 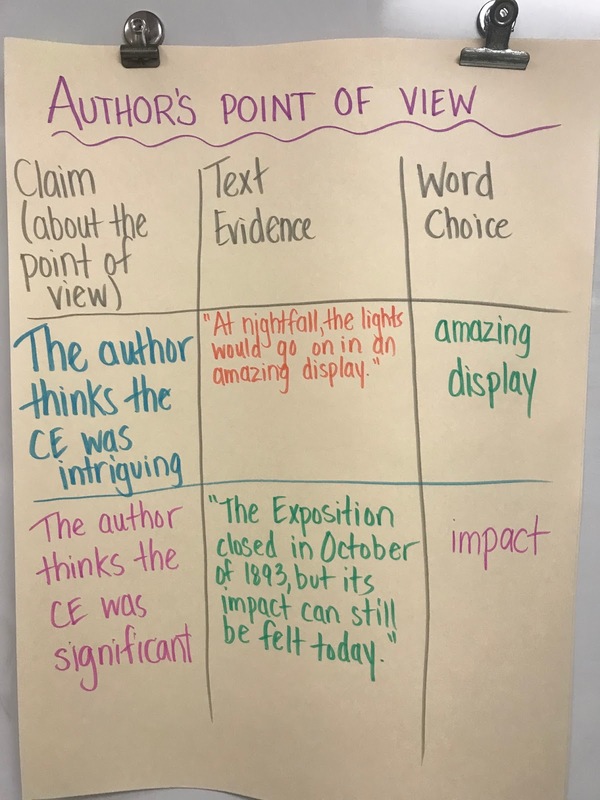 Getting kids to write strong text-dependent analysis is far more difficult than simply adopting an acronym or printing a graphic organizer. You as the teacher will need to know each text, love each text, and consider the words inside and out. Early in the year, I noticed that my students were having trouble with writing text-dependent analysis essays that actually say something. The world of text-dependent analysis is far removed from the world of everyday speaking and listening, and most students (probably most teachers as well!) haven't had much experience with reading examples of essays. So I had to provide some. In some cases, I write my own. 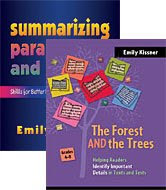 I share these with students as examples that I have written, and we've diagrammed the parts of them--introduction, conclusion, transitions, text evidence. Some students like to have these examples sitting beside them as they work on their next essays. A few introductions and conclusions end up being closely modeled after mine, but it gives these writers a starting place from which they can feel comfortable with further innovation. In other cases, I've used the texts provided by the state in the item samplers. (Pennsylvania has some nice examples available here.) As we look at these examples, I lead students in a discussion of what we like about them. What techniques can we use as writers ourselves? Students often see patterns that I didn't notice, and we talk about what worked and what didn't. As I talk with writers in these conversations, I make sure to give the ideas precedence. The ideas are the reason for our piece of writing. Our job as writers is to pull the formless ideas from our heads and hammer them into something worthwhile and meaningful to our readers. 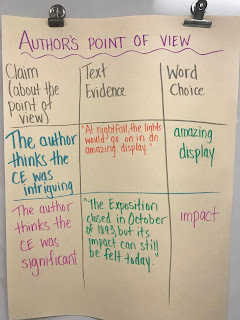 Teaching students lots of ways to collect text evidence is another important step to text-dependent analysis. Sometimes, a chart works well. 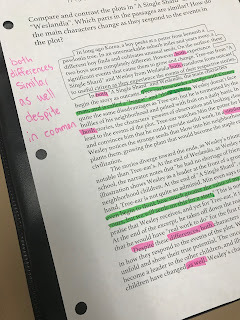 I have some students with writing difficulties in my class, and I've taught them how to number parts of the text so that they can find and label their text evidence at one point and write it at another. Having to copy a text quote twice--once in an organizer, and again in the essay--really discourages some young writers. Whatever we can devise to minimize this chore is helpful. For example, in the chart to the right, some students would write the number 1 next to the quote that they wanted to choose, and then write that corresponding number in the chart. It really helped them to focus on looking for strong evidence instead of copying! My students are never not working on an essay. I'm not sure how I feel about it either. Students have an essay to complete on each "Weekly Assessment" with our Wonders program. They're more like "Bi-Weekly Assessments" for me, as the suggested pace is laughably at odds with providing rich reading experiences for students. In addition to these assessment pieces, the only homework I give is a Summary and Analysis packet that students complete over two weeks. Calling this homework isn't exactly accurate, as students have lots of time to work on it in class. I use a soft-start to begin our day, and kids come in, chat, get computers, and work on the summary and analysis. Often, my co-teacher and I will choose to focus on the summary or the analysis part for focused instruction. Students really don't complain about these assignments; they like the texts, and they enjoy the conversations that these assignments foster. I started making Summary and Analysis packets so that I could keep using them year after year. You can find the ones that I've created here. Sometimes I look up from a student essay and think, "If someone had told me, fifteen years ago, that a sixth grader could write like this, I wouldn't have believed them." 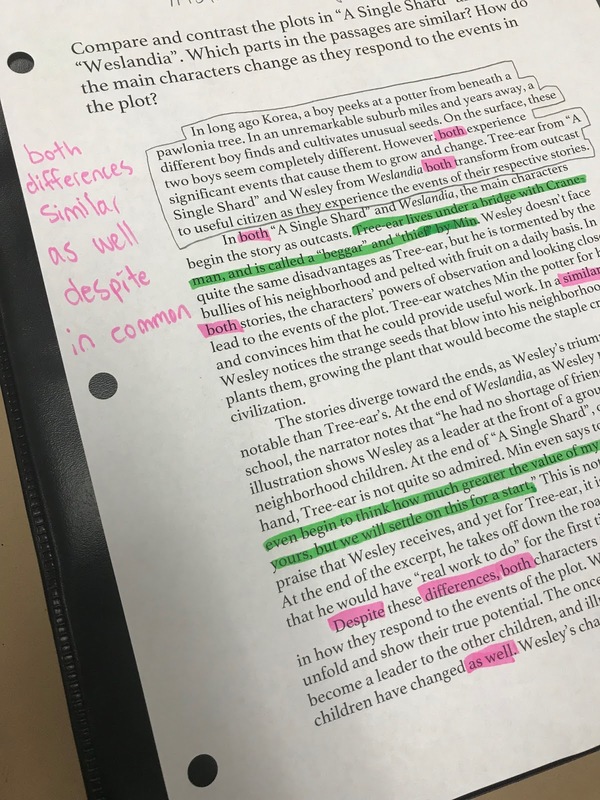 Students are capable of writing strong text-dependent analysis! And, if you approach it carefully, they may even learn to like it.